Most victims can’t understand WHY a judge or police officer would break the law or commit crimes against them. After all their suppose to be who helps them. Police are not suppose to judge however those with psychopathic tendencies often do and render their own form of punishment. 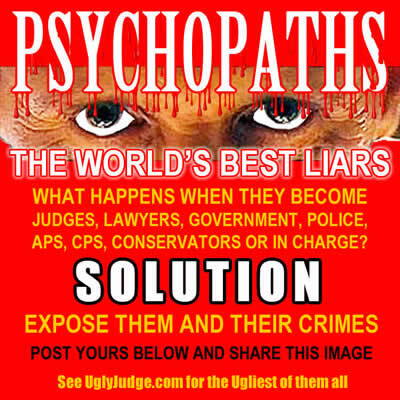 Judges who yield the ultimate power are often psychopaths who have lied their way to the bench. After all psychopaths yearn for power, control and greed. The total opposite of what one would expect from a judge. People need to accept Adolf Hitler was a psychopath and was able to come to power via his lies. 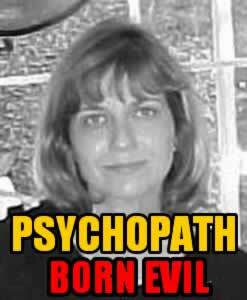 Many famous government officials today worldwide are psychopaths. They convince those around them and the masses they are someone else. Its typical and well known. If you’ve encountered a psychopath who is in power and has abused your rights do yourself a favor and do some research on how they tick. As a child I often wondered what was wrong with my sibling. Lack of empathy, cold and harsh I never could have the same relationship I noticed others had with their siblings. From infant to adult there were many signs. She would attack and destroy things she felt meant something to you. She became an expert at manipulating our mother, getting what she wanted by making her cry. By accusing her of loving one of her children more than another. By being unfair and ultimately she would say anything to get what she wanted. Ethics, morals and even honesty did not matter. The problem is people don’t want to accept or believe their own family member could be such a monster. The signs were there, the behavior and even the actions of a criminal. Yet when brought to the attention of friends and family people just don’t want to accept a child could be this way. What is worse is the psychopath will make every effort to contact family, friends and government to spread their lies, propaganda and manipulations via stories and events which never took place. Its all about being a great actress, learning how to react and putting on a great show. Doing what you think people want to see or what tugs at their heart strings. What people don’t see is the real monster, the stealing, lying, the real person when they are not putting on the act.